to handle questions from audience effectively. A presentation is a purposeful communication. In other words, it is the process of presenting a topic to an audience, with a specific purpose. Who should Learn to Make Presentations? Everyone. The skill to make a powerful presentation has now become an essential prerequisite for people from different walks of life. Students need to make presentations on various academic topics. Teachers make presentations as part of their teaching. Business professionals make presentations to customers to enhance their business prospects or to their peers to inform them of something. For your presentation to be effective, you need to plan the various aspects of it and make necessary preparation too. The brief and clear statement that you use to introduce the central argument of your presentation is your thesis. This acts as a preview for your audience and tells them what the entire presentation is about. Public speaking is a form of communication in which a speaker speaks to a group of people with a view to sharing his ideas/thoughts on a topic. The speaker might add to the knowledge of the listeners, or influence their attitudes or behaviour. For instance, as a speaker, one may have to address a gathering at a function, talk in a committee meeting or announce a toast at a wedding or birthday party. Is Public Speaking an Art or a Science? Public speaking is both an art and a science. It is an art because there are some who are born speakers. They are always willing to speak on any occasion, irrespective of the size of the audience. It is a science because one can train oneself, or be trained, to be a good speaker. All that is required for someone to be a great speaker are a few guidelines on public speaking. Your speaking skills will be an asset to you and to your organisation. You can use your skills to influence people and to motivate them to work towards certain goals. how to check your performance in a group discussion. A group discussion (GD) is a type of interactive, oral communication which takes place when a group of people get together to discuss something. A group discussion can be informal or formal. An informal group discussion occurs when a group of friends talk about things in general at their college canteen, outside the classroom, at a bus stop or any other place; or when a family talks about various things, or when a group of people talk about various matters, such as sports, train travel, price rise, examinations, favourite film stars. In these informal discussions, each one freely expresses his views on the subject. how to write a winning résumé. An interview is a type of conversation between two or more people where questions are asked by the interviewer(s) to obtain information about the interviewee(s). Interviews are mainly of two types–for assessment and for information. This unit focuses only on the interviews for assessment. They are also called job interviews. A job interview is one in which a candidate seeking employment, is interviewed by one or more interviewers in order to assess and determine his suitability for a particular position. What does attending an interview feel like? Many people feel stressed and turn into a bundle of nerves at the thought of about a job interview. But it can be a pleasurable experience if you think of it as an opportunity to demonstrate your skills and abilities, and if you care to prepare well for it. How to stay calm at the time of an interview? An interview is an important event that could lead to your dream job or career, but worrying too much about it will only make you more nervous and hamper your performance. The beauty of the English language lies in pronunciation. Accent/stress lends naturalness and beauty to your English. If you can't pronounce words clearly and stress properly, your English might sound like ‘Tinglish’, ‘Tamlish’ or ‘Hinglish’! In phonetics, accent/stress means expending extra breath on a particular syllable in a word. It is a matter of greater prominence and greater audibility. Accent is very important to make your speech intelligible. For instance, look at the words career /kəriə/ and carrier /kæriə/. Looking at the transcription you can say there is a slight difference between the two in pronunciation. But you can bring out the difference between the two very clearly by accenting them on the right syllables. So in the word career /kə̍riə/ the accent is on the second syllable and in the word carrier /̍kæriə/ the accent is on the first syllable. The mark (') on the top of a syllable in a word indicates that the particular syllable is stressed. This is known as primary stress. Primary stress indicates that the syllable is more prominent than the other syllables. There might also be a mark below on a syllable in a word. This is known as secondary stress. This indicates that this particular syllable is the next most prominent syllable. But for our speech purposes primary accent is the most important one. This book is written to help college and university students enhance their pronunciation and communication skills. The matter in the book is divided into three parts–Computer Assisted Language Learning, The Sound System of English and Communication Skills. Part one deals with the uses of computers and information technology in developing language skills. Part two endeavours to help the students learn the appropriate pronunciation of English. The focus here is mainly on the practical aspects of English phonetics. The information covered in this part, it is hoped, will help in overcoming the Mother Tongue Influence (MTI). In the era of globalization, where you are expected to speak English with global intelligibility, Accent Neutralization or Accent Reduction has assumed greater importance than ever before. Accent neutralization/reduction attempts to reduce the Mother Tongue Influence (MTI) and makes spoken English sound closer to the American or British variety. Part three seeks to help students develop their communication skills. This section also provides practical tips for effective public speaking, preparing résumés, facing interviews, making presentations, participating in group discussions and debates. We believe that this book will not only meet the needs of the target group, but also be found equally useful by all those working towards improving their language and communication skills. The book draws upon our experience of teaching English. Most of the material has been drawn from our notes and from other different sources. Unfortunately, the sources were not properly noted or available; hence it became impossible to provide accurate acknowledgements. Debate or debating is a method of interactive argument. Though a debate is basically an argument, it is not an indisciplined shouting match between parties (individuals/teams) holding different points of view. Debate differs from a group discussion in several ways. Debate is basically an argument where participants take a particular stand on a given topic and stick to it as they speak on it. A group discussion, on the other hand, is a cooperative process in which members discuss a topic and reach a consensus. You need to be very flexible in a group discussion. You need to consider others' points of view also. However, in a debate you need to have just one particular view point. In a debate, the number of participants could be from two to fifty or even more, whereas in a GD it is usually between five and fifteen. A topic is given for debating to individuals or teams. A team might consist of a minimum of two debaters and a maximum of fifty or more. CALL, an abbreviation for Computer Assisted Language Learning, is an interactive method of instruction that helps learners achieve their goals of learning, at their own pace and ability. In this method, computer technology is used in teaching/learning procedures at all stages such as presentation, practice and feedback. With the reduction in the cost of computers, most educational institutions can afford to have computer systems. A computer lab is nowadays seen as an essential requirement in any educational institution because of the increased awareness among the students, teachers and managements. By Shiv K Kumar, University of Hyderabad. I have great pleasure in writing a foreword to the book entitled A Handbook for English Language Laboratories, jointly authored by Prof E Sureshkumar and Dr P Sreehari. Since I have gone through the manuscript very closely, I can say, without reserve, that it is a significant contribution to the field of English Language Teaching (ELT) in India. This study elaborately covers all such fundamental aspects like Computer Assisted Language Learning, Phonetics of English (with special reference to accent, rhythm and intonation) and communication skills. I am particularly impressed with their presentation of interview skills, résumé writing, group discussions and debates. It is often not adequately realised that no success in any public career is possible unless one is fully equipped with these skills. Since, advancement in life depends essentially on one's capability to present one's personality as efficiently as possible, it becomes imperative that one should be equipped with these skills for interacting with others effectively. Here is a book which should serve as an invaluable companion to anyone interested in improving communicative competence through computer assisted language labs. With increased awareness among students and teachers about the importance of developing English language skills and communication skills, language laboratories have become an integral part of the paraphernalia for teaching the language in all educational institutions. 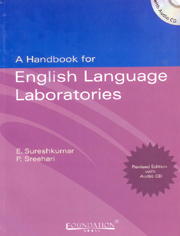 A Handbook for English Language Laboratories aims to develop students' ability to use the language accurately, appropriately and fluently for one-to-one and one-to-many communication in a variety of contexts. It also briefly introduces them to Computer Assisted Language Learning (CALL). Key topics discussed: The sound system of English Accent, rhythm and intonation Presentation skills Preparing resumes and facing interviews Group discussions, debates, role play and public speakingThis book is accompanied by an Audio CD to offer excellent models of the use of English through a variety of listening exercises. In a role play, participants act out various characters or parts. Study and act out the dialogues/conversations given in this unit. They will help you function efficiently in a variety of situations and settings. Practise them with your friends, family members and others. You must act out the roles and also keep changing your roles as you practise. Each role play should be acted out, at least twice, with the participants changing roles. Audio or video recordings of role plays can be a very useful tool for getting feedback, or you can ask others to observe you and evaluate your performance. Give more importance to how you say your dialogues. Stressing, pausing and intonation are very important. Be clear about the vocabulary and key sentences used in various dialogues. Read aloud the dialogues many times, and know what is expected of you, to make it sound natural as you act it out. As you practise the dialogues below, you will learn the ability to use language for a variety of functions like greeting, leave taking, asking for information, giving advice, warning, asking for directions, answering telephone calls, expressing delight, expressing displeasure, congratulating, expressing pain and expressing fear. Language learning, teaching and testing are activities not confined only to the language classrooms. They extend across the curriculum and even into the wider academic and professional world. Language Learning, Teaching and Testing: A Companion treats a range of issues related to the three domains under various headwords. In doing so, it elucidates aspects of theory and practice related to language acquisition, instruction and evaluation and shows how linguistics, psychology, socio-linguistics and critical awareness have impacted them. Pedagogical comments, where needed, add to the usefulness of the entries. 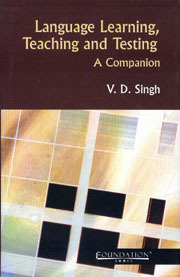 The contribution of scholars on the practice of teaching in the uniquely bilingual Indian/Asian situation is also represented in the book. A reference tool with a difference, this book will be a valuable companion for all language professionals including English language teachers (whether in the face-to-face or the distance mode), teacher educators, teachers in training, researchers and students.